Buying a real Christmas tree can be a wonderful holiday tradition, but it can also be a challenge to make that first purchase if you've never had a real tree before. These tips can help you be sure your first real Christmas tree is a beautiful and memorable start to this seasonal tradition. Can You Even Get a Real Tree? Allergies – If you or anyone in your household has severe allergies or sensitivities to tree sap, tree pollens or other outdoor elements, bringing a very large, outdoor plant into a confined living space could make for a miserable, sniffly holiday. Also take into consideration any guests who may visit your home during the holiday season and whether or not a real tree could cause problems for them. Budget – Depending on the size of tree you purchase and where you buy it from, a real Christmas tree can be significantly more expensive than a simple artificial tree. Also note the cost of a tree stand (artificial trees generally have stands included in their construction), as well as the year-to-year cost of this tradition and whether your budget can afford it, or if you'd rather spend your money on other holiday happenings. Space – Real trees come in a wide range of sizes and proportions, and if you have only a very limited amount of space to work with, it may be better to buy an artificial tree that will fit where you need it to be. If you do hope to buy a real Christmas tree, measure the suitable space carefully for both the tree's height and width, as well as doorways, stairs and other tight spaces you may have to fit the tree into in order to bring it home and set it up. Transportation – Do you have the means to bring a real Christmas tree home safely, without damage to the tree or your vehicle? Consider the size of a real tree – which doesn't come packed in a convenient box – as well as the need for ropes, bungee cords or other tie-downs to keep it secure. Also note the route you may have to take to get the tree home, including any tight clearances or other potential obstacles. Care – A real tree takes diligent care to keep it looking its best throughout the holiday season. You need to be able to water the tree daily and keep pets away from its potentially toxic or sharp needles. You also need to be able to dispose of the tree properly after the holidays are over. If you cannot do these things, such as you've planned to be away from home for several days, it may be best to avoid a real tree. When you're ready to buy your first real Christmas tree, several steps can help you choose the best tree to make your holidays festive and memorable. Real Christmas trees are available at a variety of retail lots, both at stores and independently operated. Christmas tree farms may also allow you to cut your own fresh tree. Consider the cost of trees in different locations, the types of trees available, how far you need to go to transport your tree and what the quality of trees are in different lots and farms. While buying a real Christmas tree the weekend after Thanksgiving, the first week of December or even on Christmas Eve might seem to be best for a holiday tradition, these dates aren't the most economical. Earlier in the season – as early as mid-November – there will be more trees available in greater varieties and retailers may offer early season sales and specials. More than a dozen types of pine trees are regularly sold as Christmas trees, and their characteristics can vary greatly. Some trees have very stiff, short needles and full branches, while others have longer, more pliable needles and a more open structure. Look at the overall shapes and sizes, scents and other traits to find your perfect tree. When you look at trees, check for size, proportion and stability from every angle to be sure the tree will stand tall in your home. Consider any bare patches or protruding branches, as well as any lopsided leanings. Also take into account where you will position the tree – trees in large picture windows need to look different than trees nestled in corners. Don't be afraid to give each tree you check a good, hard shake as you investigate it. Note how pliable branches may be, and how many needles fall off. A few brown needles falling off is nothing to worry about, but if there are many needles cascading from a simple shake, or if the tree is losing a lot of green needles, the tree is overly dry and in bad condition. When you've selected your tree, have the trunk trimmed again so it has a fresh cut across the base. If a tree has been cut for longer than 6-8 hours – and trees in lots may have been cut days or even weeks earlier – the base will dry out and not be able to take up water effectively. Do not, however, shave the trunk of the tree to fit a tree stand, as that will damage the tree's ability to take up water even further. Once you've bought your tree and transported it safely home, you will need to store it until you're ready for the trimming. Ideally, keep your tree in a cool, dry place where it is protected from breezes that will dry it out more quickly. Water it well and it will be fresh, fragrant and ready to go when you want to decorate it. When you're a first time buyer shopping for a real Christmas tree, it can be easy to be intimidated by the forest of options that await. 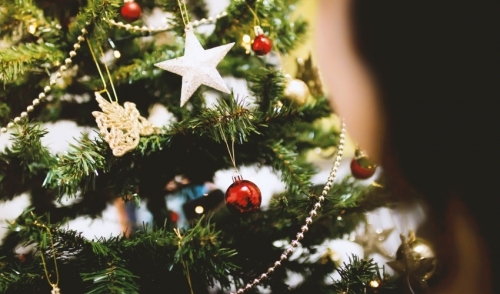 With careful consideration and savvy shopping, however, you can turn the chore of buying a real tree into a fun holiday tradition you will celebrate each year.